Congratulations to the winner, Janine Rudnick! Amy Ruth Designs is a family business, a husband and wife working together and raising a young daughter in Connecticut. Their personalized stationery, invitations, and paper goods for entertaining are high quality, bright, and playful. 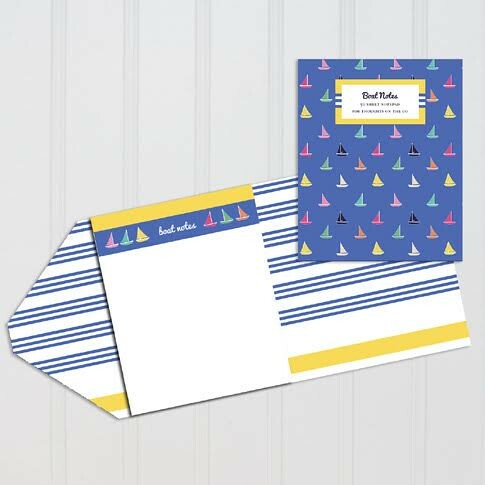 Many of the fresh designs have a nautical theme, just right for spring and summer gift giving. 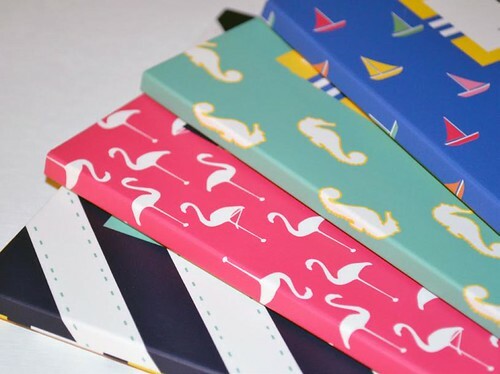 You'll find colorful journals, notebooks, folders, place mats, place cards, coasters, and iPhone cases. Add a monogram! There's also a gorgeous collection of heavy-duty, reversible wrapping paper with matching gift tags. Classic patterns abound... stripes, polka dots, and paisleys. 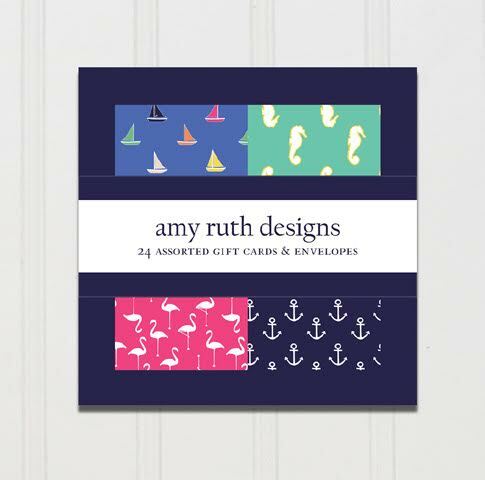 Amy Ruth Designs would like to give one U.S. reader a $50 gift certificate to use in their online shop. How nice - the winner gets to choose her/his prize! To earn an extra entry, sign up for the Amy Ruth Designs newsletter (located at the lower left corner of any page on the website) and tell me you did so in a separate comment. Be sure to include your email address or another way to be contacted within your comment. The winner will be selected at random on Tuesday, April 29 and announced on this post as soon as she/he has been contacted. Good luck! Find Amy Ruth Designs on Instagram, Twitter, Facebook, and Pinterest. Note: this is a sponsored giveaway. The opinions shared are my own. Would love to win so I could get April Showers Personalized Notepad for my mom. She is 87 and loves to write notes. This would make the perfect Mother's day gift! I signed up for newsletter also. I love the enclosure card gift set. Her nautical theme is right up my alley. My email is jgbaswell at hotmail dot com. I followed Amy by email. My email is jgbaswell at hotmail dot com. I like the circle flower design. Maybe some journals and notepaper in that design. Thank you for your offer... I would love to win.. I am always looking for anything with a nautical back ground.. 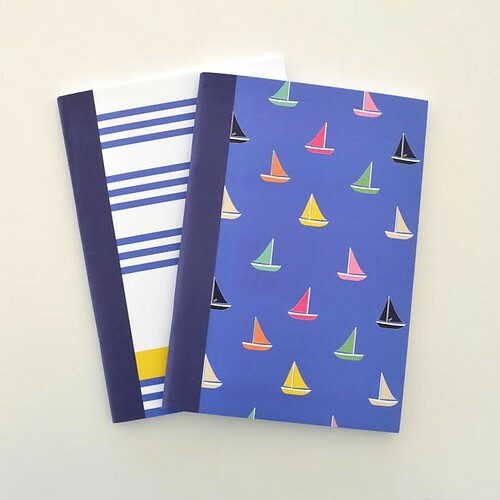 I love water so I would love to win the journal in either the seahorses or the sailboats. So cute!! Pick me! Pick me ! I love the heavy-duty, reversible wrapping paper. Hafwhit@gmail.com signed up for the fantastic newsletter. THANKS! I would pick the Anchors Away agenda!! It is so cute! I would pick the notebooks or the notepads. They would make great teacher gifts. I signed up for her newsletter, my e-mail is squeebs@suddenlink.net. Thank you! I am fond of the Daisy Paisley Reversible Wrapping Paper. The giveaway has ended. Thanks for your entries.